The Launch of the Video. 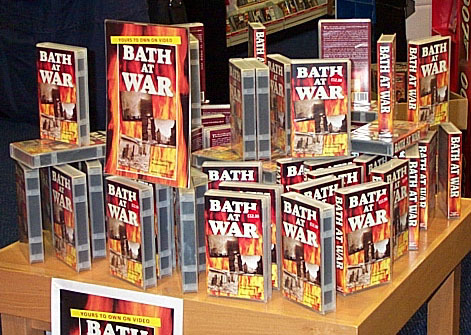 At 2:30pm on the 5th November 2002, the new video was launched in W H Smiths in Bath. Smiths had provided an attractive display, with room around it for the reporter and photographer from the Bath Chronicle to work. Most of the people who appear in the video attended, along with a representative from 1st Take Video, and each was interviewed. The Bath Chronicle photographer took a number of pictures, and at one point lined up the people who appeared in the video for a group shot. So I took a quick snap as well. From left to right: Anne Salter in front of Joe Marsh; John Follon; Ruth Haskins in front of Harry Hemming; Francis Joy.